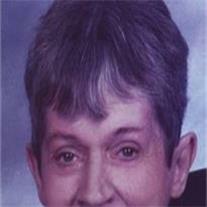 Sharon Lou Graham, 72 of Mesa passed away on March 25, 2013 after a long battle with scleroderma. Born in Minneapolis, she moved to Arizona in 1971, worked for US West here and in 1987 to Colorado, retiring in 1990. She lived in Colorado until 1997 and returned to Mesa for health reasons. She enjoyed craft work and gardening, and was active in Telephone Pioneers, Telephone Retiree Assn., and Grace UM Church. A son Jerry and daughter Nancy preceded her in death. She is survived by husband Phil, sisters Pat Franzen, Ft. Meyers, FL; Cynthia Ehlert, Estero, FL; Jean Iverson, Remer, MN; also stepdaughter Kristi Graham, Scottsdale and stepson Steven Graham (Iva), Loveland, CO. A memorial service will be held Saturday, April 13, 2013 at 1 PM at Grace United Church, 2024 E. University Dr., Mesa, AZ. In lieu of flower, a donation to Grace United Church in her honor is suggested. Arrangements by Bunker’s Garden Chapel.